Our outstanding kindergarten program provides children with the essential keys to read, write and reason and helps prepare children for the social challenges they will encounter in the years to come. A low student-teacher ratio allows the teacher and the teacher assistant to meet with each child on a daily basis to build reading, writing and math skills. To accommodate the active learning style of young students, reinforcement is accomplished informally using manipulative materials, media and creative arts. We carefully embrace each child’s individual strengths by offering a mix of challenging academic experiences which moves each child forward in all areas of development. In kindergarten, children are rapidly developing learning behaviors which they will use throughout their school careers. They learn to be part of a group, listen and follow along when given instructions, ask questions, focus for a longer period of time, communicate their ideas and their thinking and interact productively with their peers. Our goal is to build a community of learners where each child is excited, respected and engaged. Our school views the literacy competencies of reading, writing, speaking and listening as the gateway to knowledge access spanning all subject matter. 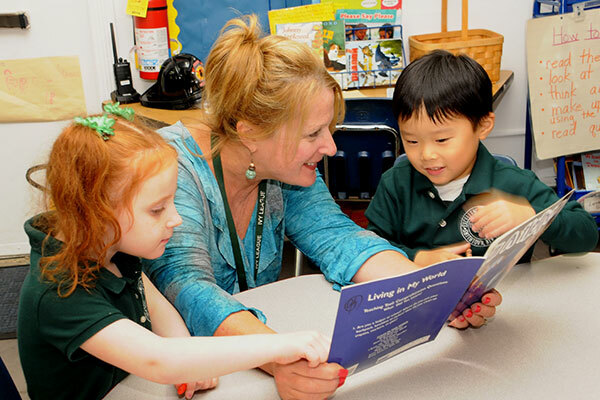 To generate excitement and foster success, the kindergarten classroom is filled with an array of fiction and non-fiction materials at a variety of reading levels and interests. In this print rich environment, students meet daily in small reading groups (2-3 children) for direct instruction as they learn letter/sound patterns, reading comprehension skills and practice reading fluently. They are continuously assessed informally and formally, and progress through more difficult reading levels as they are ready. Both the science and social studies curriculum are closely interwoven with applications of literacy skills as they apply to non-fiction texts. Written expression is a high priority in our kindergarten. The writing process begins with the teacher acting as scribe for our fledgling authors. With much modeling and many examples, children gradually begin to compose with support. Our students become young authors as they compose narratives from their personal experiences, write imaginative stories, share information, retell stories through brief book reports, and express their opinions on paper. With practice, they gradually begin to apply conventions of writing and spelling. By mid-year, children are writing quite independently. Topics which comprise our math curriculum include ones suggested by New York States Core Curriculum Standards such as: composing and decomposing numbers, place value, strategies for solving addition and subtraction problems, standard measurement, properties of geometric shapes and concepts of time, money and calendar. To present mathematical ideas in a more concrete and more child friendly way, the kindergarten teacher makes extensive use of SMART Board® technology to focus attention and to make the lesson more visual and interactive. A daily spiral review of previous lessons allows the teacher to see who is ready to go on or where errors are occurring and why. Math center activities, hands–on projects, and homework assignments provide for differentiation among learners and for enrichment. Children begin their formal study of history and geography anchored in experiences they bring from family and community and build progressively outward making connections with world history and geography. They learn about diverse cultures and traditions by participating in school celebrations, field trips and virtual tours of faraway places through SMART Board® Technology. The curriculum also increases students’ understanding of past, present and future through the study of children’s favorites topics: prehistoric animals, investigations of North American Indians who once inhabited Suffolk county and the wonders of space exploration. Our science curriculum builds on children’s natural curiosity and features hands-on experiences which include the fundamental processes of scientific investigation and experimentation. For young children, the emphasis is on discovery. Topics are organized into three themes and many mini-units focusing on the life cycles of plants and animals, properties of common elements like solids and liquids and earth science, including weather phenomenon. Children work along with a science specialist and the classroom teacher acquiring skills such as how to observe purposefully, measure, collect, record and report data, and describe cause and effect relationships.